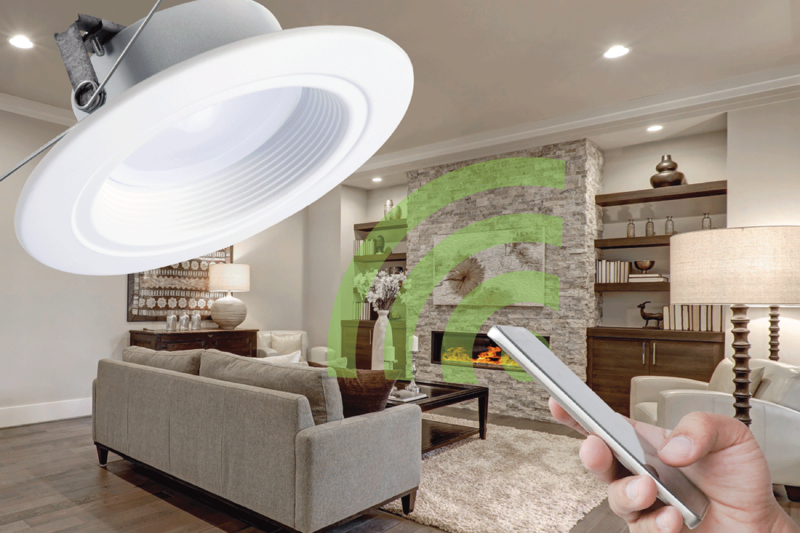 One of Eaton’s connected homes lighting solutions, the wireless LED downlight provides smooth, continuous dimming, color tuning anywhere from 2700K to 5000K, scheduling, grouping, geo-fencing, scene setting and remote access through the convenience of a mobile app. The all-in-one LED baffle-trim module works with the Wink Hub and Samsung SmartThings platforms, as well as voice-controlled devices Amazon Alexa and Google Home via these platforms. Developed with ZigBee® Home Automation technology that allows the control of the LED downlight by a smart device and hub, customers can conveniently and simply control their lighting needs wirelessly through a mobile app. Color tuning, allowing the ability to adjust the color temperature from 2700K to 5000K, while maintaining a 90 color rendering index throughout the color adjustment. Dimming down to five percent without the use of a wall dimmer. • Geo-fencing, which automatically controls the lights based on the GPS location of a phone. Grouping and scene setting to control multiple downlights together with the push of one button. • Scheduling, permitting the lights to turn on and off at specific times of the day. Automations, allowing automatic scheduled actions through the hub app. Remote access to control a home system from anywhere. Lighting is often overlooked when building a home, yet has the greatest opportunity to reduce energy use intensity (EUI). The benefit of high efficacy lighting is these products can provide up to 85% in energy savings over traditional incandescent sources and designed to last 35,000 to 50,000 hours. As the market has moved from incandescent to LED, the LED solution provide many valuable benefits and conveniences including dimming, scene setting, remote access, scheduling, geo-fencing, and color tuning capabilities — while saving energy (meets California Title 24 Residential requirements). Halo’s downlight module can provide a consistent color throughout a home that an LED light bulb doesn’t provide and the color tuning capabilities allows the ability to adjust the color temperature from 2700K to 5000K, while maintaining a 90 CRI throughout the adjustment. These high quality color options from warm to cool can satisfy every space in the home. The fixtures help solve air leakage problems that some home builders are faced with today. The downlight installs in 5-inch and 6-inch aperture recessed downlights from Halo, All-Pro® and other compatible housings. The module’s construction makes any housing AIR-TITE® for added savings and code compliance and is ENERGY STAR® certified and wet/damp location listed. Developed with ZigBee® Home Automation technology that allows the control of the LED downlight by a smart device and hub, customers can conveniently and simply control their lighting needs wirelessly through a mobile app. 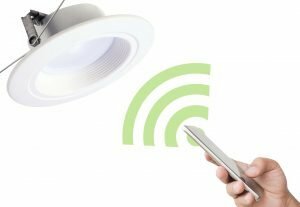 The LED baffle-trim module works with the Wink Hub and Samsung SmartThings platforms, as well as voice-controlled devices Amazon Alexa and Google Home via these platforms. Energy savings up to 85% compared to traditional sources. Used throughout the home such as in showers and outdoor covered patios for a cohesive look. Designer trims available in Satin Nickel, Tuscan Bronze or a paintable trim to match any color for a custom finish. Color tuning, allowing the ability to adjust the color temperature from 2700K to 5000K, while maintaining a 90 CRI throughout the color adjustment. • Dimming down to 5% without the use of a wall dimmer. Geo-fencing, which automatically controls the lights based on the GPS location of a phone. Grouping/scene setting to control multiple downlights together with the push of one button. Scheduling, permitting the lights to turn on and off at specific times of the day.